Potentially the smallest full-frame dSLR on the camera market, Canon's EOS 6D is a step up from the Canon 5D Mark II, but not quite at the level of the Canon 5D Mark III. 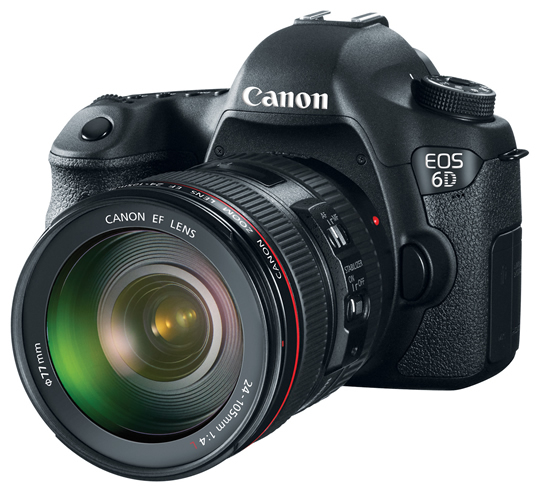 The 6D dSLR utilizes Canon's DIGIC 5+ Image Processor and offers a 20.2-megapixel full-frame CMOS sensor. In addition, the 6D offers a 3.0-inch, 1.04 million dot LCD display with a viewing angle of 170 degrees. Interestingly, the Canon EOS 6D includes built-in Wi-Fi using a wireless transmitter within the camera. When connected to Wi-Fi, the 6D can transmit photos and video to social networking sites like Facebook or devices like smartphones and laptops. In addition, media can be transmitted between compatible PowerShot cameras. Another wireless function allows the camera to be controlled through an application on a tablet or smartphone, ideal for taking photos remotely. GPS functions are also directly built into the 6D rather than requiring an add-on, external device. The built-in GPS receiver records longitude, latitude and elevation as well as EXIF data for geo-tagging while shooting. When photos are uploaded to social networks, the location data can be included to mark the spot where the photo was originally taken. Regarding video recording, the 6D can record in both NTSC and PAL video modes at 1080p, 720p or standard resolution. ISO capabilities range from 100-25600 and the Canon Auto Focus system includes a newly-developed 11-point AF sensor. Moving away from Compact Flash, the Canon 6D is compatible with SD, SDHC, and SDXC memory cards as well as Ultra High Speed (UHS-I) cards. Full 1080p HD video at 24, 25, and 30fps; 720p at 60 and 50 fps, standard video at 30 (29.97) and 25 fps. The Canon EOS 6D is expected to be released during December 2012 in a body-only configuration and kit configuration with Canon's EF 24-105mm f/4L IS USM zoom lens. The body-only 6D will have an MSRP of $2,099 and the kit version will be priced at $2,899.